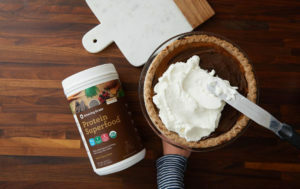 Introducing the best pumpkin pie recipe yet…chocolate protein-packed pumpkin pie recipe by Julie Morris. “As a card-carrying member of the pumpkin pie fan club, the challenge is real: how can you create an even better pumpkin pie? For this, I have two words: Chocolate Protein. While I use Amazing Grass Protein Superfood powder almost daily in my smoothies, their new Rich Chocolate flavor is too delicious to be destined solely to the blender. Adding it to pumpkin pie makes each bite turn into a hybrid of classic pumpkin and chocolate mousse – in other words, totally irresistible. Plus, the fact that suddenly you have a fully natural pie made without refined sugar, no difficult to digest dairy, and instead packed with an additional 20 grams of plant-based protein and 2 full servings of vegetables (thanks to our Amazing Grass addition which includes power-greens like wheatgrass and spirulina!) … and you seriously have one award-winning kind of dessert. Preheat the oven to 350° F. Pre-bake the pie crust according to the manufacturer’s directions (if needed). Meanwhile, to a food processor, add all the remaining ingredients except the whipped cream and cacao powder. Blend until fully incorporated and very smooth. Transfer the mixture into the prepared pie shell, spreading into a flat layer. Bake for 45 minutes. Remove the pie from the oven and let rest on a baking rack until entirely cool, about 2-3 hours. Refrigerate until ready to serve. Just before serving, spread the whipped cream on top of the pie, dust with cacao powder, and cut into slices. *You can use a store-bought variety of non dairy whipped cream, or make your own. If opting for a homemade route, refrigerate 2 cans of full-fat coconut milk overnight. Then, scoop out the separated white solids of the milk into a mixing bowl. Whisk until smooth, adding a spoonful or two of the remaining coconut milk liquid if needed to thin. May be served as-is or lightly sweetened by whipping in a spoonful of maple syrup. * This Chocolate Protein-Packed Pumpkin Pie Recipe was written & created in thanks to Amazing Grass Ambassador Julie Morris – a Los Angeles-based natural foods chef, on-camera personality, and New York Times best-selling cookbook author.